Opposition parties on Monday reiterated their demand for external affairs minister Sushma Swaraj's resignation and asked Prime Minister Narendra Modi to break his silence over the issue of "help" provided by the external affairs minister to scam-tainted former IPL chief Lalit Modi. Even as the ruling BJP stood by Swaraj, Congress slammed its "double standards" and said that the Prime Minister must apologize to the nation over the controversy. Congress party alleged that there was "quid pro quo" involved in her "assistance" to Lalit Modi in obtaining British travel documents and demanded that the scam-tainted former IPL commissioner be brought back and tried in India. Youth Congress workers staged a protest outside Sushma Swaraj's residence and demanded her resignation. External affairs minister Sushma Swaraj is at the centre of a major row over helping scam-tainted former IPL chief Lalit Modi to obtain British travel documents. Here is a TOI lowdown on Sushma Swaraj-Lalit Modi controversy. 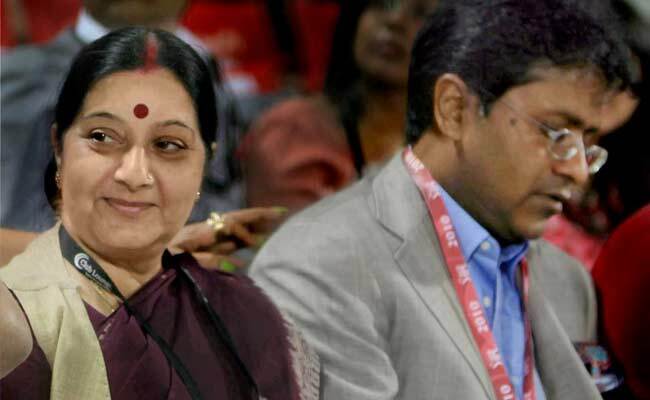 Sushma Swaraj says "sometime in July 2014", Lalit Modi sought her help as his wife was suffering from cancer and he had to be in Portugal for a surgery on Aug 4. July 31, 2014: Keith Vaz emails UK visas and immigration director Sarah Rapson, saying Sushma had told him that the Indian government had no objection to UK issuing travel document to Lalit Modi, bilateral relations would not be affected on this count. Says she has also spoken to high commissioner James Bevan. Adds, "Frankly everyone has been involved in this apart from (UN secy-gen) Ban ki-Moon!" Aug 1: Rapson writes to Vaz that issue has been resolved, documents have been handed over to Lalit Modi's solicitors. Hours after Rapson's mail, Lalit Modi emails Vaz, Sushma's husband Swaraj Kaushal and daughter Bansuri, among others, thanking them for their efforts. Enforcement Directorate is probing foreign exchange (FEMA) violations amounting to Rs 425 crore in IPL TV rights deal awarded to World Sports Group by Lalit Modi in 2009. Blue-corner notice pending at all Indian ports/airports; if he is traced anywhere, he should be handed over to ED. The former IPL czar has been in London since 2010 after just one interrogation session with I-T dept and ED in Mumbai. UPA govt revoked his passport in March 2011 but it was restored by Delhi high court in Aug 2014. Sushma’s daughter Bansuri Kaushal worked with U U Lalit, who was Lalit Modi’s legal counsel. Sushma’s husband Swaraj Kaushal reportedly sought Lalit Modi’s help in securing admission for his nephew Jyotirmay in Sussex University. Sushma denied the allegations. Govt and BJP stand by minister. Amit Shah says "no moral grounds" involved; home minister Rajnath Singh says, "whatever she has done is right". Oppn demands Sushma's resignation, wonders if help extended to Lalit Modi had PM's "prior approval".